Seem to be clearing some of their fine wines, got a nice Barolo last week and now they have this Chat Du Pape!! Enjoy!! Just treated oh to bottle of the chocolate block. 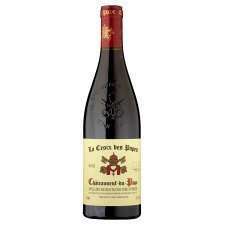 Not the greatest CDP but definitely worth a go at this price. Well spotted. Nice to see it sub £8 even if only by a penny. Do you still get 5-25% discount for buying 6? Fed up of drinking wines that are more châteaneuf du cr*p than pape. Hopefully this little red will have more bouquet than a florist and a better body than Kim Kardashian. This stuff is overrated imo. Not the greatest CDP but definitely worth a go at this price. Well … Not the greatest CDP but definitely worth a go at this price. Well spotted. This deal is no longer available according to the Tesco site. Don't know why CDP always seems to get heat on here - most of the supermarket CDPs I've tried have not been worth the money. you and yours - bbc radio 4 - today, just after noon. Research questions whether wine connoisseurs really know what they are talking about. It's disgusting how much we pay for wine in this country. Go to France and they wash their feet in this stuff. I watched a program once where they asked wine connoisseurs to describe different wines that were served in dark glasses. It was interesting to watch most of them describing certain wines as red wines, only to see their looks of dismay as white wine was poured out afterwards. Already … Already posted:http://www.hotukdeals.com/deals/tesco-store-half-price-clearance-fine-wine-1976126Don't know why CDP always seems to get heat on here - most of the supermarket CDPs I've tried have not been worth the money. I find most supermarket wine on the same par as cheap French table wine. Waitrose do a few nice bottles but you have to pay for it. It's best to research wines and buy bulk from wine merchants on the internet. Ah the classic wine chat. If the only research you do in to your wine is the price then you deserve to drink the bad stuff. I find most supermarket wine on the same par as cheap French table wine. … I find most supermarket wine on the same par as cheap French table wine. Waitrose do a few nice bottles but you have to pay for it. It's best to research wines and buy bulk from wine merchants on the internet. That's like asking me to recommend a car I'll tell you what my favourite from Waitrose is that won't break the bank though. It's the Catena Malbec Argentinian Red. Argentinian Malbec is my favourite red. Very drinkable wine, paid £15 for this once. Thanks but no I meant wine Merchants who will do bulk buy import from France etc for individuals in smaller quantities than restaurants. I can't find anything except very grand expensive fine wine importers or grotty wine run Calais 'sell the sludge to the English' crews. Direct from the Cave or small local producer used to be fairly easy to find but since the internet it all seems to be commandeered by the various wine club set ups. I like that Catena a lot - especially when they reduce it to £10. Argentine wines can be great value. The Trapiche Broquel Bonarda that Tesco used to sell was a favourite of mine as well. Who said that you needed to spend £600? I agree this CDP is a hot deal for this price but personally I would spend the money on a different wine and pay out a little more (£15/20) for a nicer CDP. Thanks but no I meant wine Merchants who will do bulk buy import from … Thanks but no I meant wine Merchants who will do bulk buy import from France etc for individuals in smaller quantities than restaurants. I can't find anything except very grand expensive fine wine importers or grotty wine run Calais 'sell the sludge to the English' crews. Direct from the Cave or small local producer used to be fairly easy to find but since the internet it all seems to be commandeered by the various wine club set ups. Who said that you needed to spend £600? I agree this CDP is a hot deal … Who said that you needed to spend £600? I agree this CDP is a hot deal for this price but personally I would spend the money on a different wine and pay out a little more (£15/20) for a nicer CDP. I was just being stupid but also highlighting what a nice bottle of Chateuneuf-du-Pape looks like for anybody that's interested. I agree with you; if I'm getting a bottle of this variety of wine (usually at Christmas time) I'd look to spend about £15/20 too. I watched a program once where they asked wine connoisseurs to describe … I watched a program once where they asked wine connoisseurs to describe different wines that were served in dark glasses. It was interesting to watch most of them describing certain wines as red wines, only to see their looks of dismay as white wine was poured out afterwards. This is the same for all consumables, It is all a question of taste. You can stack up a good bottle of cava against a highly priced Champaign for example, but you will always get people on every drink imaginable trying to convince you their choice is best, and usually they will always go for the most expensive. The thought that you are treating yourself can influence the mind and convince you you're are getting something special. I now brew my own wine, and I guarantee if many tried it without knowing they would say it was a decent bottle, but tell them before hand and their face instantly scrunches up (because it's cheap and not luxurious enough). All value is imagination. This is the same for all consumables, It is all a question of taste. You … This is the same for all consumables, It is all a question of taste. You can stack up a good bottle of cava against a highly priced Champaign for example, but you will always get people on every drink imaginable trying to convince you their choice is best, and usually they will always go for the most expensive. The thought that you are treating yourself can influence the mind and convince you you're are getting something special. I now brew my own wine, and I guarantee if many tried it without knowing they would say it was a decent bottle, but tell them before hand and their face instantly scrunches up (because it's cheap and not luxurious enough). All value is imagination. I picked up a bottle of this in my local Tesco a couple of weeks back at the reduced price. I got around to drinking it at the weekend and found it to be a bit 'meh.' Nothing special at all. I would not have been happy if I paid full price. If you buy a bottle I would recommend opening and letting it breathe at room temperature for a couple of hours. This definitely improved the taste of the one I had. Just paid 15 quid for this for the father in law. lol. Lots of bogus wine chat in this thread by the way. I lived in France for 5 years and believe me, their cheap table wine is undrinkable - I mean to the point of bad reflux. CDP is not cheap over there either, cheaper than over here maybe but still recognised as a premium wine. Good price for UK, total rip off compared to France prices though. Just popped into Northcott (NI) Tesco and picked up a New Zealand steam wharf road syrah (2009) for 7 quidish, down from 15.